The story of Samson, which had a great attraction for the Baroque public, is prominent in Rembrandt’s production during the thirties. He painted Samson Threatening his Father-in-Law (1635, Staatliche Museen, Berlin) and the Marriage of Samson (1638, Gem�ldegalerie, Dresden). His Blinding of Samson more than any other work shows Rembrandt’s unrivalled use of the High Baroque style to appeal to his contemporaries’ interest in the sensational. It is his most gruesome and violent work. The painting represents the bloody climax of the story. Samson has been overwhelmed by one of the Philistines, who has the biblical hero locked in his grip. Samson’s right hand is being fettered by another soldier, and a third is plunging a sword into his eye, from which blood rushes forth. His whole frame writhes convulsively with sudden pain. The warrior standing in front, silhouetted against the light in the Honthorst manner, has his halberd ready to plunge into Samson if he manages to free himself before the hideous deed is done. Delilah, with a look of terror mixed with triumph, is a masterful characterization seen in a half haze, as she rushes to the opening of the tent. Here again the chiaroscuro adds an element of mystery and pictorial, as well as spiritual, excitement. The whole scale of light, from the deepest shadows to the intense bright light pouring into the tent, has gained in power and gradations over the works of the Leiden period. 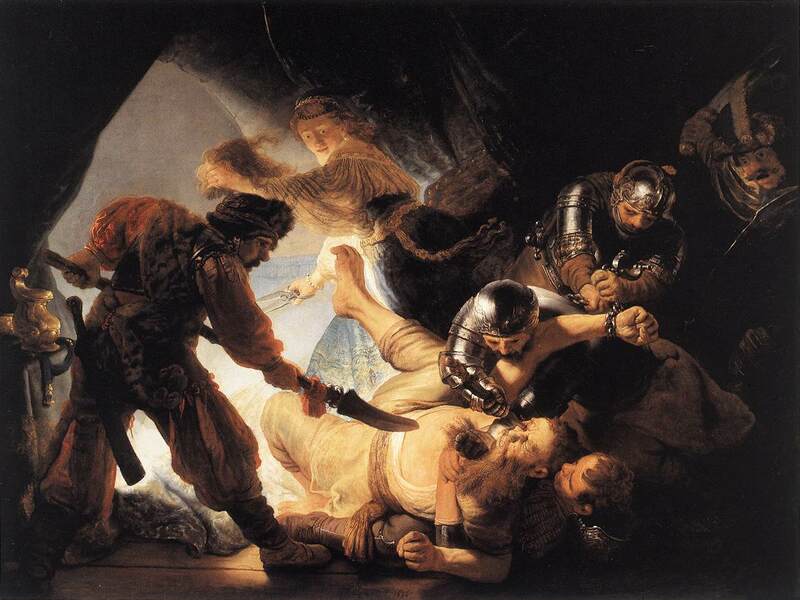 The scene could not have been represented with more dreadful accents, and Rembrandt may have finished it with the triumphant feeling of having surpassed Rubens’s dramatic effects, for this picture was also inspired by a work of the Flemish master: The Capture of Samson (now in Munich). This large painting originally was even larger. Several copies are also known.